I was unimpressed with Red Mango. I didn't like the mochi nuggets very much and their yogurt tastes exactly like Pinkberry's. When I went they had mango but no pomegranate. I'm not sure if pomegranate is ideal anyway, because of the seeds. I guess they're layering fads. So far I've tried kiwiberry, pinkberry, Yogurtland, and red mango. My favorite plain yogurt came from kiwiberry; it was tarter and more refreshing than the sweeter pink/red was. Yogurtland, I have no self control so I always bury the plain yogurt in every other flavor--I can't really compare. The trouble at kiwiberry is that they had the gall to put out canned pineapple and lie and claim it to be fresh pineapple. And just to make matters more confusing the kiwiberry I visited in Santa Monica closed and was replaced by yet another yogurt joint whose name I can't recall, then moved two doors down and purportedly will reopen shortly. Now when I want frozen yogurt I go to a California Roll and Teriyaki joint near my apartment. They decided to hop on the bandwagon and offer a frozen yogurt bar too, and it's not bad; they're using the same yogurt mix as Pinkberry, I guess. The trouble is they only offer strawberries by way of toppings but the advantage is there's no line and it's cheaper. WTF? Golden Spoon anyone?!?! I'm just kidding but seriously...i'd rather have more savory food than stupid yogurt. 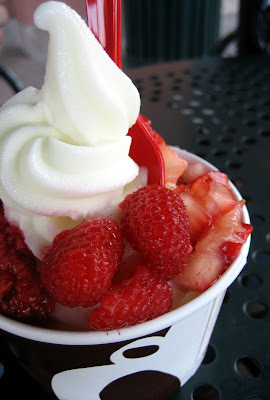 Red Mango - the OG of the "real" frozen yogurt phenomenon. I'll check it out. This whole frozen yogurt craze is starting to look like the race for the Democratic Presidential nomination. Edwards vs Obama vs Clinton. All pretty much the same but a little different flava with each. One of these just opened in Lakewood. I'll have to check it out. Not a huge fan of the new wave fro yo. I just have a hard time getting over that chemical after taste. And I love how people justify buying by saying "it's yogurt, it's healthy." What they should do with the volcanic crater in the middle is to put your "toppings" in there; of course it would be called "filling" at that point. The product itself is healthy, of course, until customers decide to add on love-handle inducing toppings on the yogurt. I'm sure customers love to keep sipping on 20-calorie-per-boba drinks. These sweet delicacies all originated in Asia. Certainly these desserts serve well for the locals because of the weather and lifestyle. My observation is that opening dessert bars define a trend in the real-estate business. No offense but, do I really want to spend $5 on a customized, soy ice cream while shopping at South Coast Plaza, or would I want to drive to Tustin and enjoy an $8 award-winning seasonal tart by Zovs in the middle of nowhere on Seventeenth Street? Take Yogurtland, for example. They hire at most 3 employees on a busy weekend, while offering 16 flavors of yogurt and 20 different toppings. The quality of the yogurt is satisfactory, in my opinion, because I would not spend extra $5 of gas to drive to Bella Terra for a better tasting yogurt at Pinkberry. (Unless I visit my parents on the weekends, of course.) But the marketing concept of Yogurtland is almost incomparable. A buffet line for yogurt? 16 flavors to choose while making my very own topping combinations? As a consumer, speaking for the majority, I seriously doubt that taste would be a huge factor here. Most of us know that Tapioca Express and Lollicup don't make quality tea, yet the business function more promisingly than Cha and Tea Station. I don't really think it's about tasting the difference of yogurt here. Whether it's canned of fresh mango, heck, if I feel spending only $2 on dessert today, I am not going to drive to Bella Terra and spend $4 on off-season mango. I want to try Red Mango just to make a comparison. I like Pinkberry. My friend got the plain yogurt with mango and mochi. It was good but would have been better if Philippine mangoes were used. The mango bits were a bit sour. I like Yogurtland because there are so many choices but with all those available flavors sometimes putting in the toppings are bit much already. The frozen yogurt craze hasn't make it's way to the midwest yet. I mean, we have places that sell it, but, apart from TCBY, not many that specialize exclusively in it. Of course, I have my own idea for a dessert craze. I don't think many people would follow it, though. Chilled (but not frozen) durian pods as an ice cream substitute. I make sundaes with them, and top brownies with them. So yummy! IMHO, durian is better than ice cream or frozen yogurt any day. What can I say? No one ever accused me of being normal. I haven't had it yet, but I saw that Pinkberry also has pomegranate as a seasonal topping. And I never noticed that hollow center before! Another frozen yogurt injustice! I've actually tried a Kiwiberry -- the one in Diamond Plaza in R.H., but I dunno. I guess it comes down to whether you are a person who likes tartness or a person who likes sweetness. I'm of the latter. Yogurtland's is actually too tart for me. I go for their Golden Spoonish varieties. And oh yeah, the taro! The taro is da bomb...and why am I talking like a high schooler? I guess it's because I'm talking about Yogurtland again. Yeah, I know what you mean. But I wouldn't be a good Irvine food blogger if I didn't post about the new Red Mango. Back to regular programming this coming week, I promise! Would you believe I had to look up O.G.? Original Gangsta?! I'm such a square. Great analogy though. Wish I thought of that! Judging by the responses, it's a love it or hate it thing. I personally like it, a whole lot. I wonder where you'll be on the sliding scale? Dude. That's brilliant. Patentable too. If someone from a yogurt company or franchisee is reading this, you'd better give vegasbuff his dues if you use this idea. Seriously! All great points! I can tell that you are an MBA (as am I) or at least someone who's knowledgeable in marketing. Another angle is how Yogurtland gives the illusion that you are spending less for your dessert where the reality is that, on average, you spend as much as Red Mango, Pinkberry...well, maybe not Pinkberry. But close. I agree. The last time I had Yogurtland, all I got was the taro. And I topped it with three mochi balls. That's it. And that's all it needed. Even as I type this, I've just finished a Watermelon icy from Lollicup. I am elmomonster, and I am a hypocrite. Of course, I did not opt to have boba with my watermelon icy...yuck...although they seem to really want to push it on me. I'd eat that! Actually I have. An occasional indulgence from the Indonesian Street fair I visit: durian milk shake...yummmmy! The quickest a durian has gone from fruit to my mouth. It was the first time for me too (seeing the hollow center in the yogurt). Although I've read about it, only this time did I experience it in all it's glory...well, all it's negative glory that is. I had a feeling you were going to review them. They are within walking distance of where I live. I've been once and got a small with raspberries and dark chocolate chips. Already have an idea for my next mix. Thanks for the review on Red Mango! I heard about it opening but haven't got around to going there yet. I've been to Yogurtland and I actually like the tart yogurt there (with strawberry, raspberry & blueberry toppings) so I might not like the Red Mango yogurt as much, if it's sweeter. I've never even had frozen yogurt, but I'm already tired of reading so many stores offer it! we tried the red mango tonight. had the "plain" with mango and strawberries. it was good. i'd come back here again. the tart taste profile of the yogurt reminds me of the vietnamese yogurt that my mom made for us when we were kids. you can still find them at lee's sandwiches. we also tried the pinkberry in little tokyo last weekend. can't tell the difference between the two. i wonder which of these concepts will be the last one standing in the battle for fro-yo supremacy? Yeah, I knew I had to review them when I saw them building it. I don't know if I'm going to bother with Pinkberry when they come around to open here though. I'd be curious to know if Irvine's tastebuds are already acclimated to Yogurtland's sour yogurt that they wouldn't like Red Mango. Good observation! Curiously, NY's cupcake craze hasn't seemed to replicate itself in L.A. Perhaps L.A. is too health-conscious? Honestly, you're not really missing anything by not trying it. Eddie Lin is right, they all quack the same tune, regardless of the name. I also wonder this, but perhaps it's time for a Vietnamese yogurt chain to come up to speed. If they can charge a measly $2 for a banh mi sandwich they should be able to charge fifty cents for a cup of yogurt. You're right. Fewer calories = more people. Plus the fact that people like us are talking about it must also help. Hello. Just wondering if you tried Beach Berry at Huntington Beach. I like them the best out of all of the frozen yogurt places!! The hole lacking in yogurt makes me sad. I always want to complain, "Excuse me, the last time I was here, the middle of my yogurt was missing." 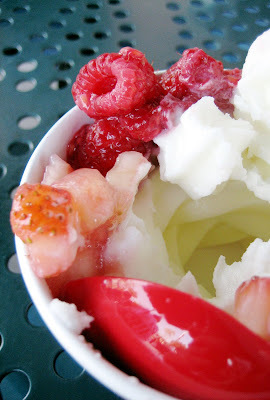 I know this post was written way back in November -- but have you tried Pinkberry yet? I'm curious. Regardless of it being an obvious food fad, I am a hopeless fan. And after trying out many different froyo places, you do notice differences. For example, some places' versions have a hint of cheese (not a good thing). And even Pinkberry locations differ from one another. Yes, I eat a lot of frozen yogurt. Also, I would like to say, durian is my favorite favorite. I wish could eat it everyday. And I think its smell is glorious. Please share if you find any fabulous local durian offerings. P.S. What Indonesian street fair?! Guess what? I haven't tried Pinkberry. I probably will, since not one, but two are opening in Irvine/Tustin...but I doubt I'll be writing about it. I'm pretty sure they don't need the publicity, and also, I'm not all that excited about a place that's already too overexposed. And what Indo Street Fair? Well this one, of course!!! Have you not been! If not, you must! Like this Saturday! It's a 5 minute walk from our office. The moment I tasted this, I never went back to ice cream. Red Mango will be opening next to the Puente Hills mall in the City of Industry, CA and in Diamond Bar, CA. They are expected to open early-mid 2009.